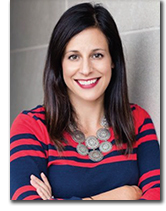 Sara Ziemnik (Miami '99) returned to her alma mater on April 12 for the Manning Morgan Memorial Lecture, sponsored by the Department of History, to present "Making the Past Present: Insights from the National History Teacher of the Year." Last fall, Ziemnik was named National History Teacher of 2017 by the Gilder Lehrman Institute of American History. "Even though I got this award, I don't feel like I am the best teacher, because I am not," Ziemnik said. "I still feel like I just started, and I still feel like I have so much to learn." Ziemnik graduated from Miami in 1999 with a major in secondary education and comprehensive social science and a minor in history. In addition, she was president of Alpha Gamma Delta and a "superstar" broomball player. For the past 18 years, she has taught AP U.S. history and world history at Rocky River High School in Rocky River, a suburb of Cleveland. "My car just knew where to go when I was driving back from Cleveland," Ziemnik said of returning to Miami for the first time since her college reunion in 2009. Her talk focused on today's importance of history and history education. "History matters," she said. Ziemnik began her talk with the harsh reality of how history is viewed in society. "The challenge today is we lost sight of what really matters and the humanities are under attack," she said. The audience shares a laugh with Sara Ziemnik. Ziemnik explained the importance of history from a personal and societal level. Yet, she described the harsh reality that history courses and subjects are no longer required by school districts, even in the state of Ohio. In many schools, world history is now considered an "elective," a class a student need not actively pursue. Ziemnik encouraged the students and faculty to not lose sight of the importance of history, but rather continue to feed their obsession. "You can be on the relentless pursuit of truth and engaging conversations with others that challenge you," she said. "We have inherited the past, so we have a unique responsibility to acknowledge that it affects us." Ziemnik said that she owes her career to Michael Fuller, professor emeritus of teacher education. Fuller encouraged her to apply to the James Madison Fellowship in 2002, and she was given a full scholarship to the graduate school of her choice. Ziemnik chose Cleveland State University and spent a summer studying at Georgetown University to earn her masters in history in 2004. Fuller surprised Ziemnik at her Gilder Lehrman award ceremony in New York City last fall. 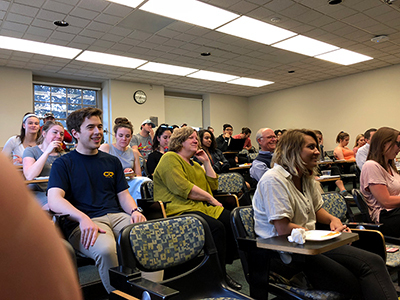 "The time you spend in college sets your future: the classes you take, the projects you do, the friends you make, the professors you work with, all make a difference," said Helen Sheumaker, senior lecturer of History and American studies. "Sara reminded me that history is just plain fun to do, challenging and meaningful." Ziemnik assured that there are lots of jobs that Miami students can do with a history major because it promotes critical thinking. "Google finds STEM skills aren't the most important skills" was the title of an article that Ziemnik presented to the room of history and history education majors. When Ziemnik admitted that her parents expected her brother to be a business student, the audience chuckled. "History is something students and instructors love, and it provides skills to build a career with," Sheumaker said. "Sara tells her students what we know and helps them develop critical thinking, research, and writing skills — what employers are looking for." "What gets me up in the morning is knowing I have to teach my students this subject," Ziemnik said. "This is the last time they'll ever hear it, and I have to do it right." She said that her ideal course to teach would involve human rights and probably be related in some way to the past 50 years. "I am actually going to South Africa this summer with 30 students, and I am so excited," she said. "I am fascinated with stories about people who have overcome immense odds. Something related to that would be my perfect class."